During the year of 2012 I travelled several times between Paris and Amsterdam. Because of my huge passion for street art and biking, those two cities attract me as a perfect alchemy. 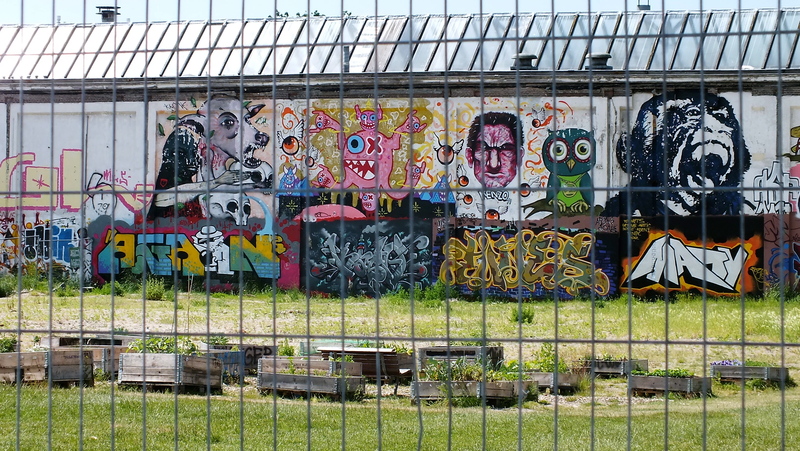 On my first trip to the Dutch capital, a city well known for its liberal way of thinking, I discovered a painting on a empty lot that caught my attention. A huge stencil of a monkey, quite screaming, in black and white. When I shared my pictures on facebook, Thom Thom, a French street-artist and co-founder of Le M.U.R. 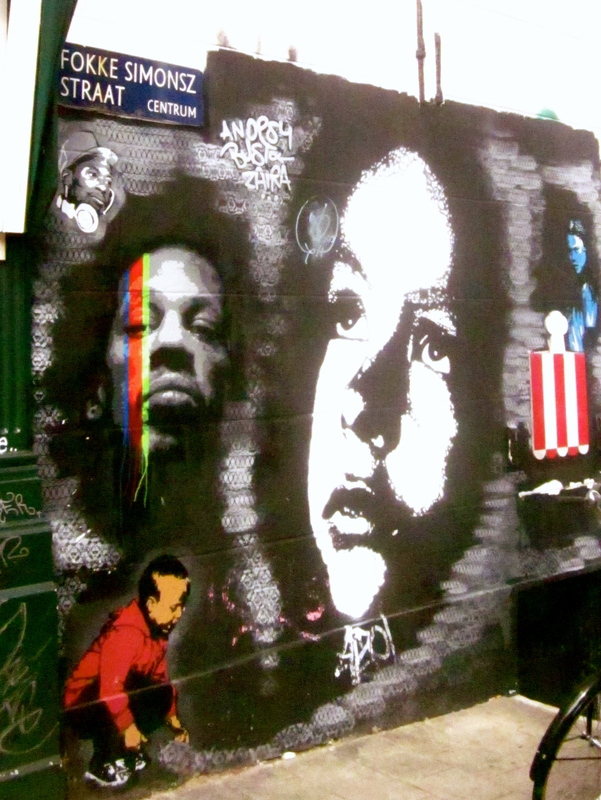 (an important organization that promotes street-art in Paris) gave me the name of the artist: Bustart. After a while I met Thom Thom in Paris during a performance at Le M.U.R. He was wearing a black t-shirt with the monkey from Bustart. In that moment I realized how I really like this character. It’s not just about a beautiful monkey drawing, more than this. Unconsciously I knew that I should discover more about this artist. 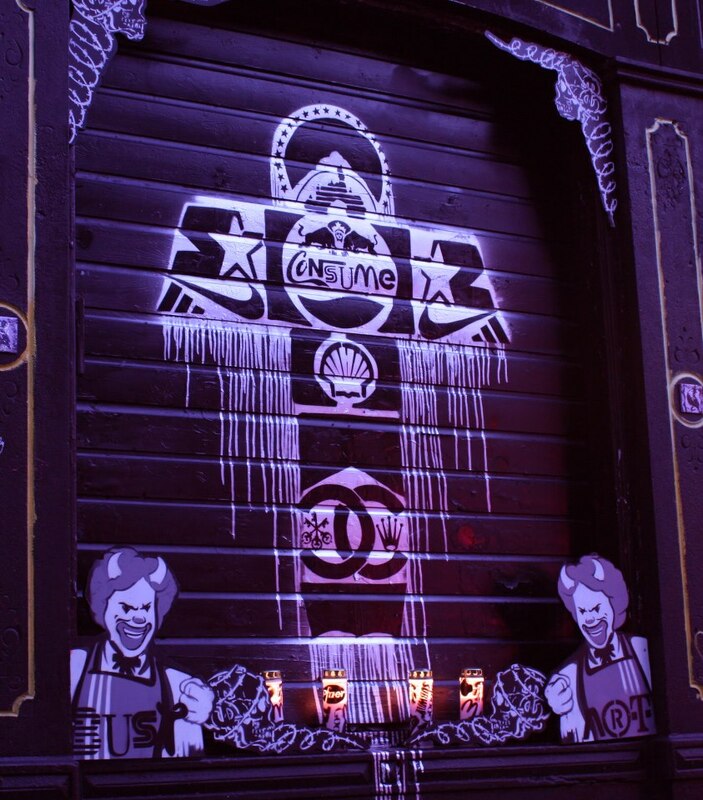 Bustart is a street artist from Basel, Switzerland, based in Amsterdam. He left his city a while ago after being arrested several times for graffiting in the walls of one of the most important city in the art-world. Nowadays he is a versatile street-artist that works with different techniques and wants to provoke through his message. Non-stop is the best way to define Bustart, his art is everywhere in Amsterdam. 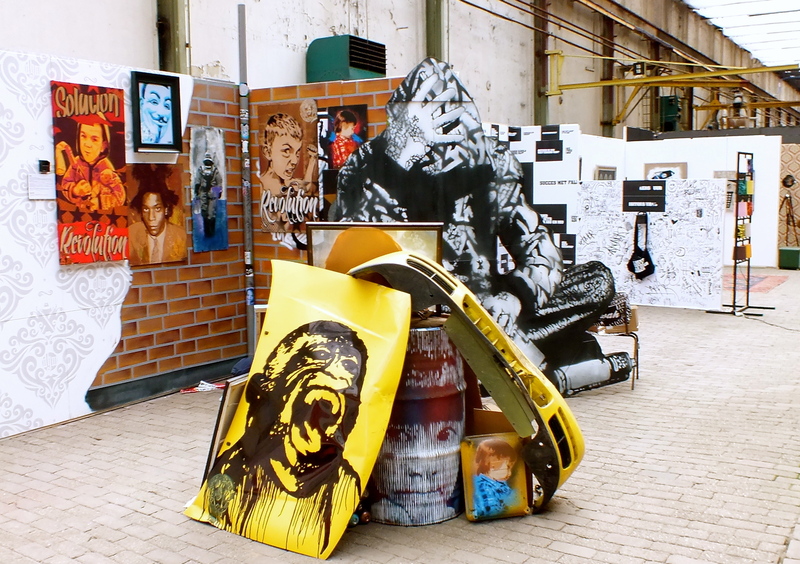 After discovering the outstanding monkey from Bustart, during my others trip to Amsterdam, his art was revealed to me by some paintings on the streets containing imperative words, such as: Belief, Consume, Revolution, Solution…. From this new discoveries I could understand the reason why I get so connected with the monkey of Bustart. 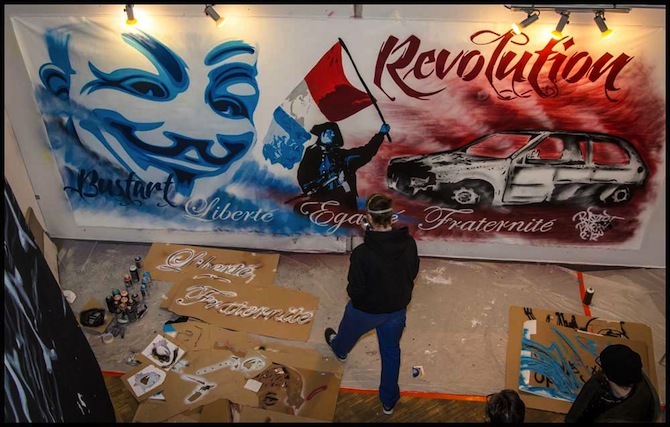 Revolution by Bustart. Work on the left by Zaira in Amsterdam. Consume Devil by Bustart. Work on the left by Zaira in Amsterdam. 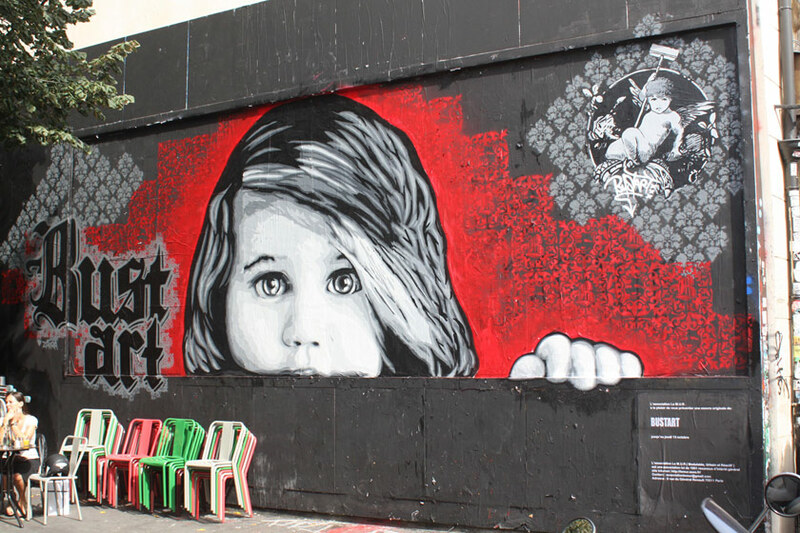 I’m fascinated with the fact that street-art can be a powerful way to fight against big corporations that handles upon 99% of the world for the profit of 1%. Naturally this is not the only message that can be intrinsic in street-art. In fact there is no limit, street-art and graffiti are suppose to be a transgressed way of self-expression for everyone that wants to manifest one’s ideas, thoughts or share their creations freely on the public spaces. I strongly believe that street-art can bring positive things into people’s life: Hope, love, inspiration, joy, freedom, dreams, accessibility, interaction, and many others. But I confess that I have a special taste for artists that have skills to provoke a critical way of thinking. Bustart has been doing it. His art-work contains a critic sense of propaganda and consumption, that makes me remember the work of Ron English, Shepard Fairey and the culture jamming. 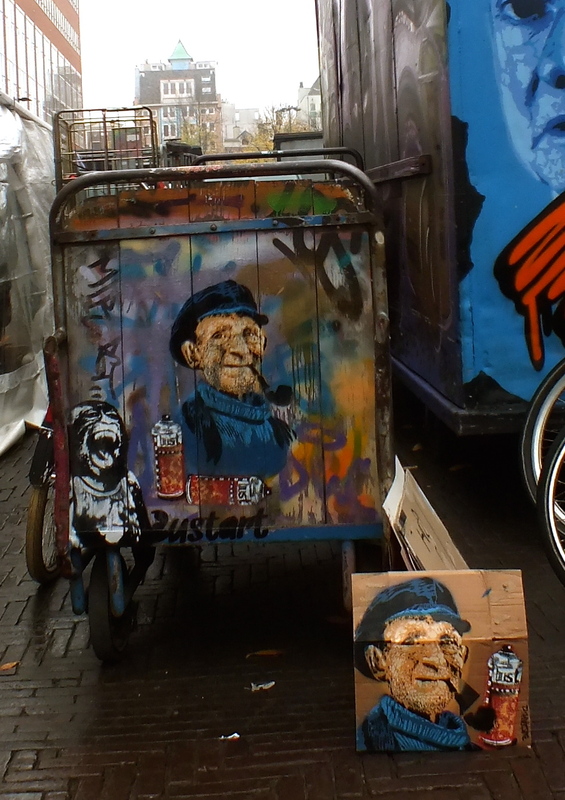 During my time in Amsterdam this year I counted more than 30 works of Bustart on the streets. Also a big show that he was involved named Urban Art House last August, moment that I could appreciate his work on canvas and installations. Finally, last November at the show Le M.U.R. de L’Art in Paris, through Thom Thom again, I met Bustart personally. During the show I had the pleasure to interview him for the street-art documentary that I’m working with Alternative Paris. Moment that he was accompanied by his girlfriend and artist Zaira. This footage is reserved for the edition of the documentary, but you can see below a video teaser with Bustart and other street-artist that Alternative Paris crew also produced at this time. 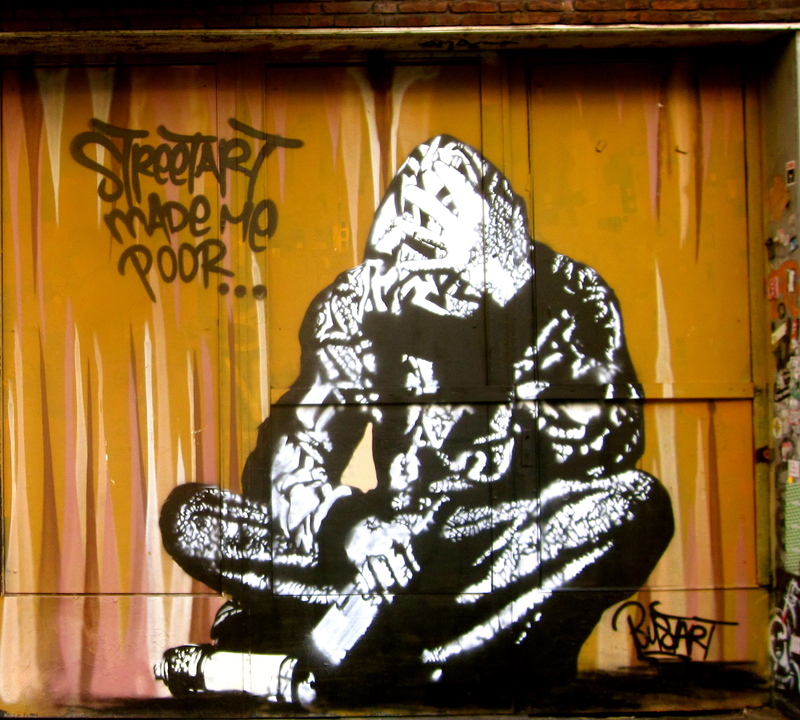 As a non-stop street-artist, during his time in Paris, Bustart naturally did some illegal works on the streets. 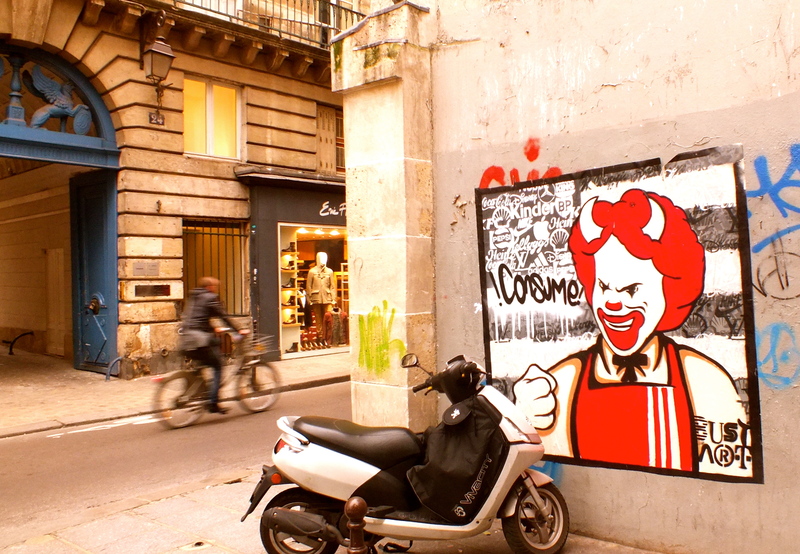 I was surprised that a poster of his campaign Consume devil, was kept for almost a week on the streets of Le Marais, a temple for consumption in Paris. Bustart and Zaira during my interview for Alternative Paris – documentary. On my last trip to Amsterdam, a week later after interviewing Bustart and Zaira in Paris, I hang out with the couple of artists. 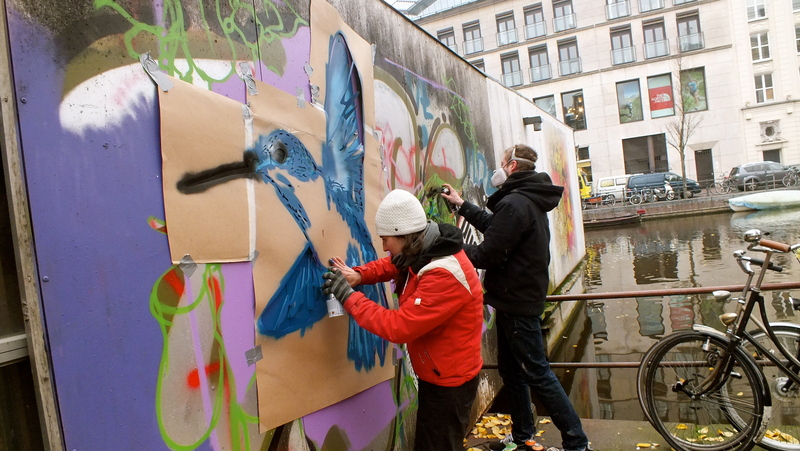 We biked around Amsterdam to discover new works on the walls and I also watched them performing on the streets. Street art + bike = perfect alchemy. My year of 2012 have all been running by incredible connexions and discovered as I had with Bustart travelling between Paris – Amsterdam. Right now, by the end of 2012 it is time to dream with new goals for 2013. I really expect to continue seeing the work of Bustart and Zaira but this time more often in the streets of Paris. Let’s cross fingers.